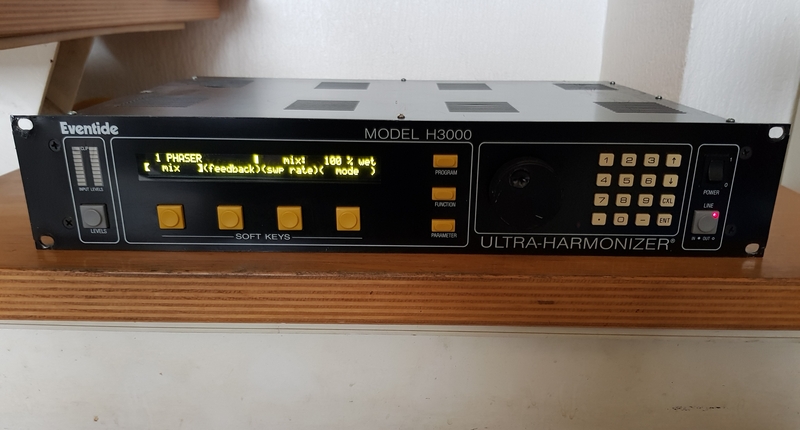 H3000 ULTRA HARMONIZER, Autre effet studio de la marque Eventide. The Eventide H3000 Ultra-Harmonizer has found its way into almost every professional studio in the world. It's range of effects and upgradable presets and algorithms have allowed the H3000 to enjoy a long successful life. The introduction of the Mod Factory option allows modular analog-like contruction of effects presets. The H3000DSE has 21 algorithms with 600 standard presets, including the presets from the H3000DSX. The H3000 offers a variety of effects, including true stereo pitch shift, pitch-correcting diatonic pitch shift, linear-predictive vocoder, six voice polyphonic synth, and a 19 waveform LFO function generator with full control via a comprehensive MIDI implementation. The multi-shift algorithm allows pitch shifting over a six octave range great for mangling and processing audio. Reverse and layered pitch shift are also available. Also available are instant phaser, multi-band delays, swept comb filter, and ultra-tap delay. The built-in waveform function generator operates like a synthesizer's LFO - its 19 periodic or triggered waveforms plus pink and white noise are assignable to most all parameters of the effects program. It's possible to create MIDI triggered effects, unique chorus modulations, autopans, and tremolos. Editing the effects programs is fairly straight forward, and greatly assisted by the well thought out user interface. The front panel features a large green backlit 80 character LCD display with four soft buttons. Parameters can be edited with the data entry knob, up/down buttons, the numeric keypad, or via MIDI. Dual ten segment bar graph meters aid in setting input levels. I find the H3000 an indispensible tool in the studio, and is exceptional on guitar, synths, and even drums. The delays are superb and the mod factory option adds a lot of flexibility and yields unique sounds. 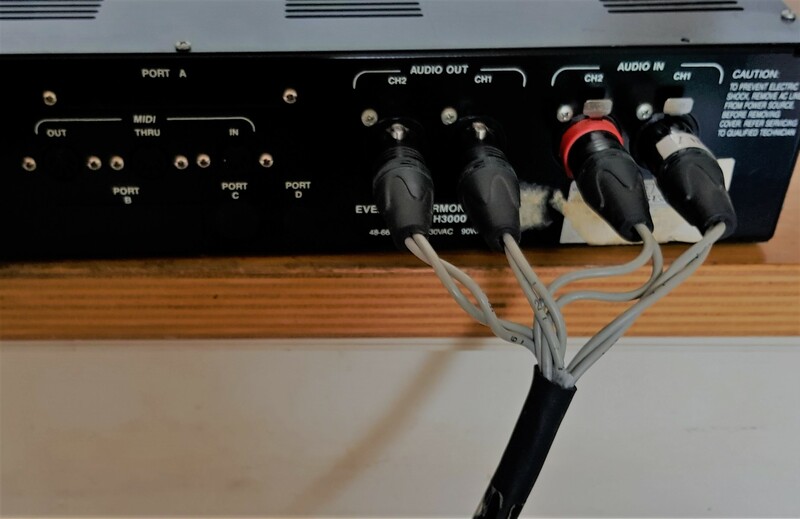 The H3000 is starting to show its age though, having been been replaced in the Eventide line-up with the DSP4000 and the brand new multi-channel 24bit/96khz Orville. Nonetheless, Eventide has done a great job supporting the unit and still makes the broadcast, sampler, and mod factory options available. The Eventide H3000 Ultra Harmonizer is a unique studio effect that is one of the first of its kind in terms of harmonizers. It is an all analog unit and is a rack mountable unit that will take up two rack spaces. 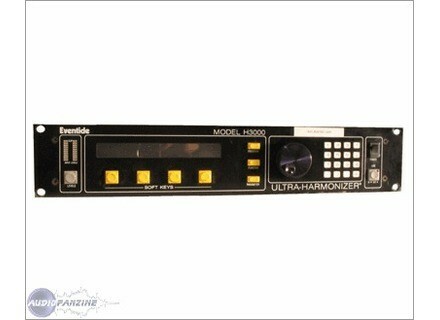 I'm not sure what connection types the Eventide H3000 Ultra Harmonizer has because the studio I have used it at has it pre racked. The configuration of the Eventide H3000 Ultra Harmonizer isn't the easiest to follow, and since it is a unique effect, it takes a little while to understand and be able to use everything on this unit. There aren't that many parameters, but the lay out is sometimes hard to follow since it is one of the first analog harmonizers out there. The possibilities are pretty varied when it comes to this unit, but isn't the easiest unit to navigate on. The sound quality of the Eventide H3000 Ultra Harmonizer is pretty good considering how old this unit is. It can definitely be useful in the studio if you want to figure out or add some harmony parts to your vocals or any other instruments you might want to add to. I mostly have used the Eventide H3000 Ultra Harmonizer for vocals, but have also tried it on guitar and keyboards, with some pretty interesting and cool results. I've been using the Eventide H3000 Ultra Harmonizer for about five years and it is definitely an interesting piece of gear to say the least. When it comes to harmonies, I would rather actually sing them myself than let a machine do them for me, but this can provide you with some awesome sounding effects and definitely has interesting creative capabilities to it. The price isn't that cheap if you can find one used, but I wouldn't really recommend buying one of these unless you are a professional studio anyway because it isn't worth it this day and age. The Eventide H3000 Ultra Harmonizer is definitely worthy of a try though. 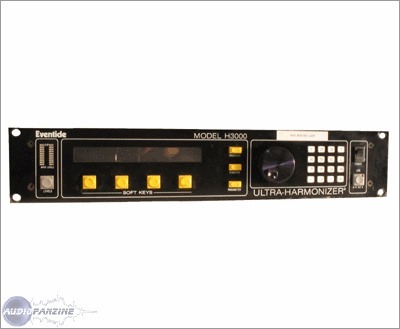 L'Eventide H3000 Ultra Harmonizer est un effet de studio unique qui est l'un des premiers de son genre en termes d'harmonisateurs. Il s'agit d'une unité toutes les analogiques et est une unité de rack qui va prendre jusqu'à deux espaces rack. 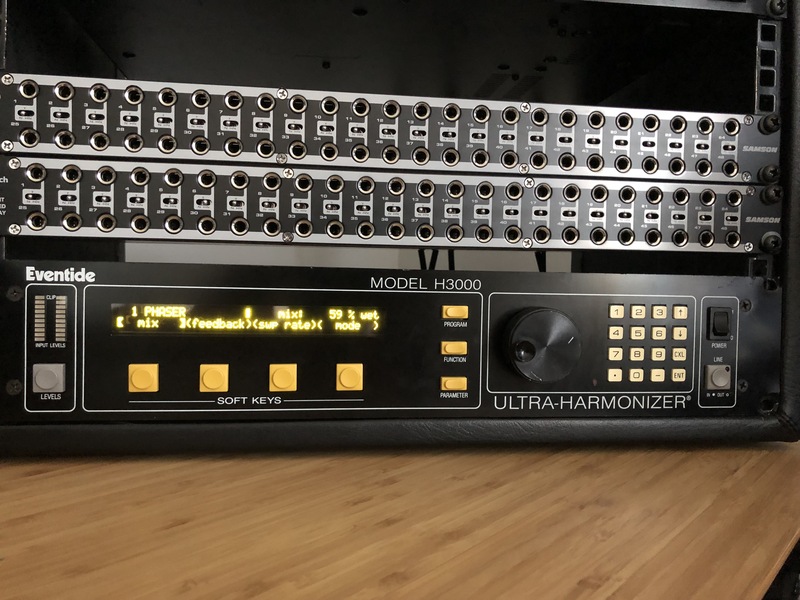 Je ne suis pas sûr de ce type de connexion de l'Eventide H3000 Ultra Harmonizer a parce que le studio je l'ai utilisé à l'a pré soutirés. La configuration de l'Eventide H3000 Ultra Harmonizer n'est pas le plus facile à suivre, et puisque c'est un effet unique, il faut un peu de temps pour comprendre et être capable d'utiliser tout sur cette unité. Il n'ya pas que de nombreux paramètres, mais la mise en page est parfois difficile à suivre car il est l'un des harmonisateurs première sortie analogique là. Les possibilités sont assez variées quand il s'agit de cette unité, mais n'est pas le plus simple appareil pour naviguer sur. 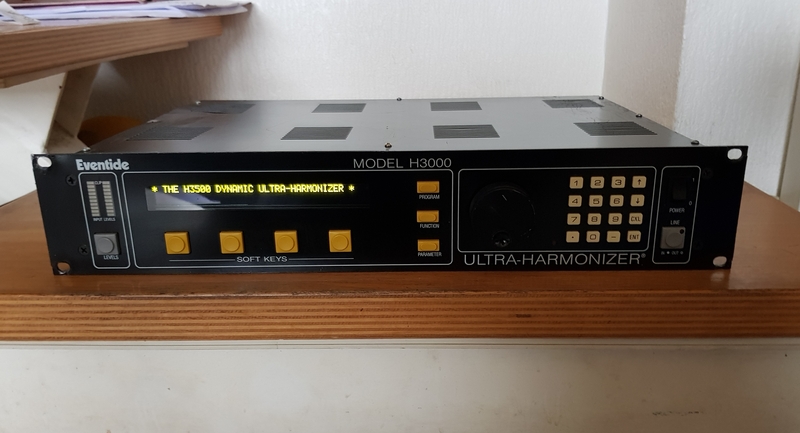 La qualité sonore de l'Eventide H3000 Ultra Harmonizer est assez bonne au vu quel âge cette unité est. Il peut certainement être utile dans le studio, si vous voulez comprendre ou d'ajouter quelques pièces d'harmonie à votre voix ou tout autre instrument que vous pourriez vouloir ajouter. J'ai surtout ont utilisé l'Eventide H3000 Ultra Harmonizer pour les voix, mais ils ont aussi essayé à la guitare et aux claviers, avec des résultats assez intéressants et laisser refroidir. J'ai été en utilisant l'Eventide H3000 Ultra Harmonizer pendant environ cinq ans et il est certainement un morceau intéressant d'engins pour le moins. Quand il s'agit d'harmonies, je préfère vraiment les chanter moi-même que de laisser une machine de les faire pour moi, mais cela peut vous donner quelques effets impressionnants de sondage et a certainement intéressante capacités créatives pour elle. Le prix est pas si bon marché si vous pouvez en trouver un d'occasion, mais je ne serait pas vraiment recommandé d'acheter un de ces sauf si vous êtes un studio professionnel de toute façon parce que c'est pas la peine de cette journée et l'âge. L'Eventide H3000 Ultra Harmonizer est certainement digne d'un essai bien. c'est quoi un ULTRA HARMONIZER ?